The survival of Delhi depends on its two lifelines, the River Yamuna and the Delhi Ridge. Of these, the Delhi Ridge is the extension of the Aravalli mountains that, above the surface of the Earth, terminate in North Delhi and go all along to neighbouring Faridabad, Gurgoan all the way till Jaipur and beyond. Due to rampant construction activities, the Aravallis are being built upon, destroyed and removed as mountains. This has direct consequence for Delhi and is yet another factor causing the local weather, and resulting climate, change in Delhi. 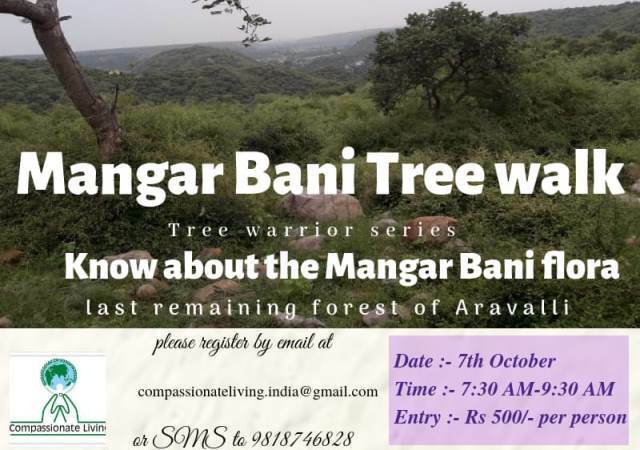 The Compassionate Living organisation invites everyone to Mangar Bani Tree Walk as part of its Tree Warrior Series. The Walk will introduce the participants to Mangar Bani, the last remaining forest of the Aravalli close to Delhi. The Entry fee for the walk is Rs. 500/- per person. Interested citizens can register by writing an email to: compassionateliving.india@gmail.com or by dropping an SMS to 9818746828.